Last week I visited my friend Dixie, who just had a baby boy 6 weeks ago. Not only did I get to cuddle with her son, Sadie got a present! Her daughter’s Dora couch, which was hidden in her closet and we snuck out while she was playing on the Wii. Just kidding, she said it was fine to give away. Anyways, I was psyched because I’d had a couch like this when I was a kid and loved it! Hours spent there reading and sleeping too, probably. 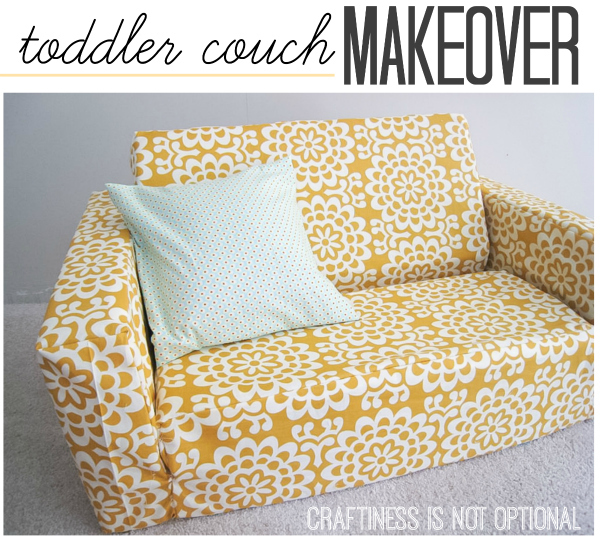 Dora just wasn’t quite our style, so I decided to make a slipcover! Then. I started pinning, sewing, ripping seams out, whatever until I got it figured out. Some of you may be thinking I am crazy. And don’t get me wrong, I probably am. But this was fun for me! I enjoyed it a lot! It was challenging. That’s for sure. I still have to finish the bottom, and create a closure system…I’m thinking snaps, because the original zipper broke and I don’t know where to find a 3 foot long zipper. Please ignore any stray threads or lack of ironing, I haven’t gotten around to that yet. So, what do you think? Here it is all folded out…just begs for a cute quilt to cuddle with, doesn’t it? Hmm, I still have some fabric left….new project! Of course I had to make a quick pillow cover for a tiny throw pillow! Featured on Oh Dee Doh! You are amazing. This turned out so cute! That is very cute. I think it will be used non stop! I am SO impressed! WOW! Love the color, love the fabric, love the size, the re-make, every bit of it all! WOW. It makes me want to thrift for one…but I don’t even have a kid! Seriously, is this the kind of project that you just keep looking at?! I would! You should be so pleased with yourself! 🙂 Love you! Very cute!! I love the Amy Butler Fabric you picked! Sadie is going to have so much fun with the couch. I’m so glad you brought new life to it. BTW, Kirsten’s baptism is going to be on July 31st at 7pm. We will bless David right after the baptism. You, Rory, and Sadie are invited to come. I think I’m going to go to your etsy store and order another tie shirt for David to wear for his blessing. Jess, that’s so amazing! I love the fabric choice and can’t wait to see the quilt you come up with. It inspires me to get back to my sewing room and do something else now that I’ve finished the boy’s Jedi costumes. Cute makeover! What’s a Nekkie girl? OMG I’ve been trying to do this on my couch for such a long time! I was totally dumb and bought a WHITE couch…and it shows everything…and that makes me sad. Oh you must come make me a cover!! I love your choice of fabric too! I think this is fantastic and that you should market these! 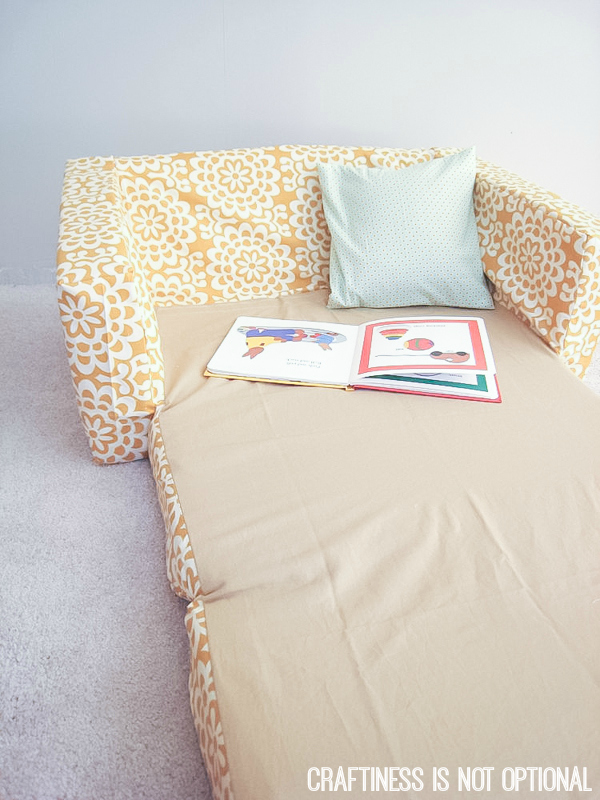 i’m sure there are tons of kids out there who have outgrown their favorite characters but would love to keep their comfy couches! Cindie- hi! glad you like the couch redo! I would be happy to share any tips I could with you, but i don’t think i’ll be making any more of these any time soon…although it’s not as hard as you think, just time consuming. Let me know if you are going to try it! Any chance of a tutorial?? I would love to get one of these couches but we don’t do character items here. I would get one to recover but I just wouldn’t know where to begin. Any kind of help would be appreciated. How much fabric is needed? Measurements etc? I ripped all the seams from the old cover and laid them out to cut the new pieces out, labeling all of the pattern pieces. (front, side, etc) then I pinned pieces together right sides in, starting with the fold out section, then the insides of the couch, then the outsides. I used about 2 1/2 yards of material for the cover, and 3/4 yard for the inside lining. (tan fold out part) I hope this helps any! I should have taken pictures, but really they wouldn’t make much sense…it’s hard to show detail with this kind of thing in pictures. good luck to anyone who tries it! let me know if you have any questions, i’ll try to help as much as I can! Your couch turn out so cute! Do you mind if I post your picture on my FAB fabrics blog? The sofa looks so much nicer. I have used them many times including getting them to make custom sized zips and they are fabulous. Hi! I love love love the couch! I’ve featured it over at weebabystuff.com I hope that’s ok, just give me a shout if it’s not. 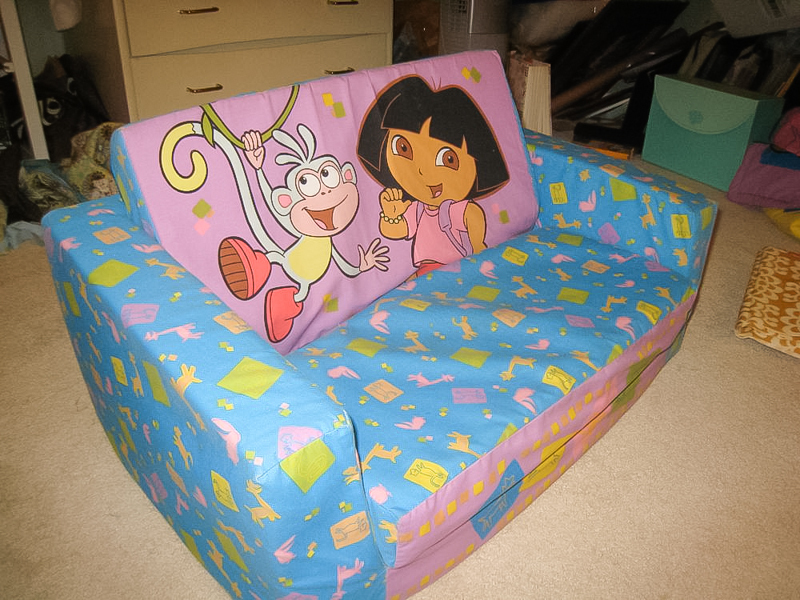 I just stumbled on this when I was seacrhing for slip covers for a dora couch that we inherited from my sister. I love this. I’m really sad that you’re not making more and selling them. I would buy one in a heartbeat. This is so awesome!! I’m going to try it…walmart only had dora and princes so I’m going back to get one! I’m going to rip it apart and try sewing a new cover. =) We’ll see how it goes!! I discovered your blog last night and I’m fairly certain I’ve spent at least 6 hours reading. LOVE THIS! It’s so refreshing to see new ideas, not just copy-cat ideas. I was thinking of doing something like this for my daughter for Christmas this year. I know you did this several years ago, but do you have any clue how much fabric you used? It’s beautiful! Thanks so much for sharing your talent with us. Your girls are darling and are so lucky to have such a talented mama! i was just given 2 couches from my sister in law and i have 3 kids under age 4…i am not a professional seamstress but you inspired me to try this project. thanks for your creativity and for sharing your project! Did you happen to keep the pattern? And if so could you please share ??. I don’t have it, so sorry!